Here's a collection of posters, booklets and other projects we've put together through the years for you to download, print out, edit, repost, or whatever you like. All we ask is that you don't sell any of it, and link back to us when you can. An 8 page, 5.5" x 8.5" primer to Naris Capitol on the world of Valmaira, where our deployment is taking place! Print one out for yourself and keep your local commissar at bay. Produced for Adepticon 2016. A 12 page, 5.5" x 8.5" xeno rag recovered and impounded. Xenologists suspect these pages contain tips and tricks for finding love, vacation escapes, and other forbidden heretical topics. Produced for Adepticon 2017. A 16 page 8.5"x 11" booklet brought to you from across the segmentium by the holo shopping network, this coloring book comes packaged with the acceptable range of munitorum grey oil-sticks. Good fun for troops of all ages. Produced for Adepticon 2017. 8.5"x11" versions of the troop options section within the White Shield's Coloring Book. A painting produced for Adepticon 2016, printed on canvas, framed and raffled off for charity. This image is only available in low resolution. A painting produced for Adepticon 2017, printed on canvas, framed and raffled off for charity. This image is only available in low resolution. 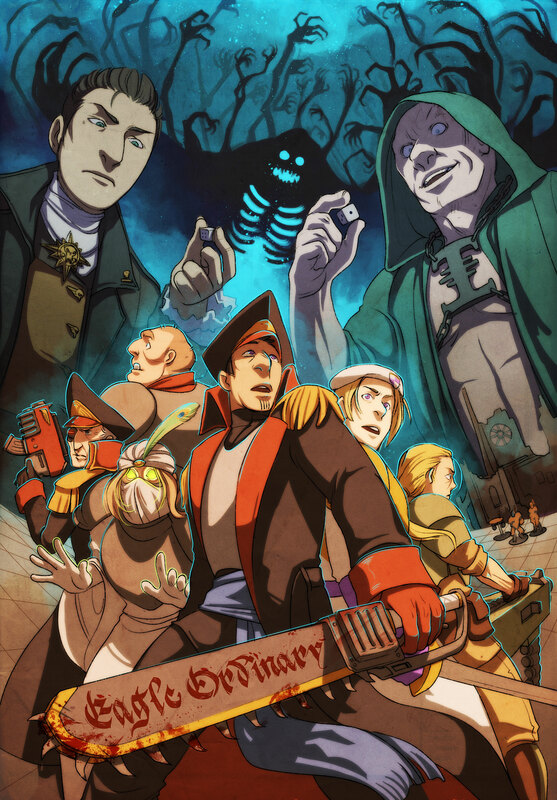 Our first poster for the comic, featuring the main cast during the arch of the first four chapters.